If I had a choice between Hanna-Barbera's Flintstones or the Jetsons, I would have to say the Jetsons. 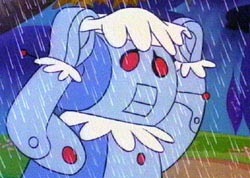 The Jetsons cartoon has robots and spaceships! 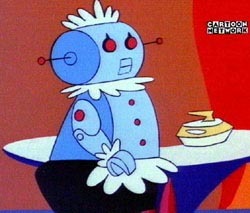 Rosie, the maid robot was (and is) a sweet, caring robot. She added charm to the cartoon that complimented the other characters. Rosie had a mothering quality that is contradicted in the picture (left). 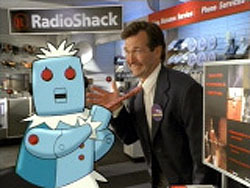 A Radio Shack representative is having his tie pulled by an apparent disgruntled Rosie. Maybe he sold her the wrong diodes? Excellent "shock value" advertisement with Rosie completely out of character. 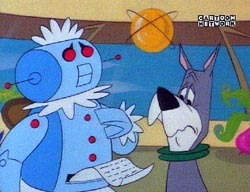 Rosie, along with the Jetsons, has blessed our television sets since the 60's. 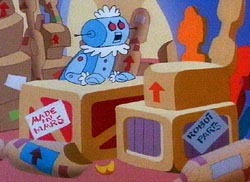 I'm sure the Jetsons will be with us for decades to come, and into the days when household cleaning robots are a reality. This is my tribute to the most "endearing" robot ever created. Thank you Rosie! 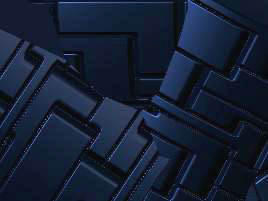 ACME City: Create your own Jetsons home page with 20 free megs & images!